A married couple by the name of SCHLOSSER formed the company in 1969. At that time, besides the manufacture of moulds, emphasis was placed on injection moulding processes and card holders and dividers were produced for the pharmaceutical trade. Beginning in 1971 at first spectacle frames and then lenses were supplied to the optical industry. Managing Director Peter Pronath acquired a 50% share of the business in 1978 followed by a 100% acquisition ten years later. This high-tech business produced a broad spectrum of various plastic parts right from the start and rapidly went on to become one of the leading companies in the medical technology field. Today particularly pipettes and medical technical consumable articles leave the production centres by the billion. 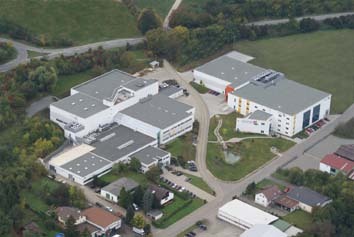 In 1994 a further production shop was put into operation. Now it was no longer a matter of space but of technology. For cuvette and measuring utensil production very high standards are demanded and clean rooms were necessary in order to guarantee an automization of the parts for specific light value dimensions. Now clean rooms of class 100.000 take up two-thirds of the production areas. Again, in 1999 a production area of 2,700 m2 and a clean room of 700 m2 area were put into operation. The company neared the border of its growth potential in the year 2004. Consequently, expansion was put on the agenda in 2005. Once more, space was provided in the form of a storage area of 1,500 m2 and a clean room area of 1,350 m2 was also added. At the present time, the company stands out on account of its competent development and production in many branches of medical technology. Each area operates independently. The interaction between development and production underscores the efficiency of an innovative and reliable partner.